The Red Sox took a 3-1 lead in the ALCS Wednesday night with a thrilling 8-6 win over the Astros in Houston that featured a game-changing home run controversy. A two-run Jackie Bradley Jr. homer in the 6th inning gave Boston a 6-5, and the Red Sox stretched their lead to 8-5 by the 8th. The Astros scored one run in the bottom of the eighth and loaded the bases with two outs in the bottom of the ninth, but left fielder Andrew Benintendi made a spectacular diving catch to end the game. 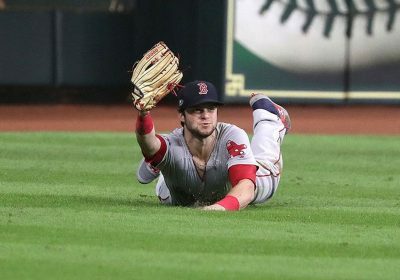 71-year-old broadcaster Joe Castiglione was on the call for WEEI, and he fell out of his chair following Benintendi’s highlight-reel grab.